Carbon capture and storage: solution, stopgap or bust? 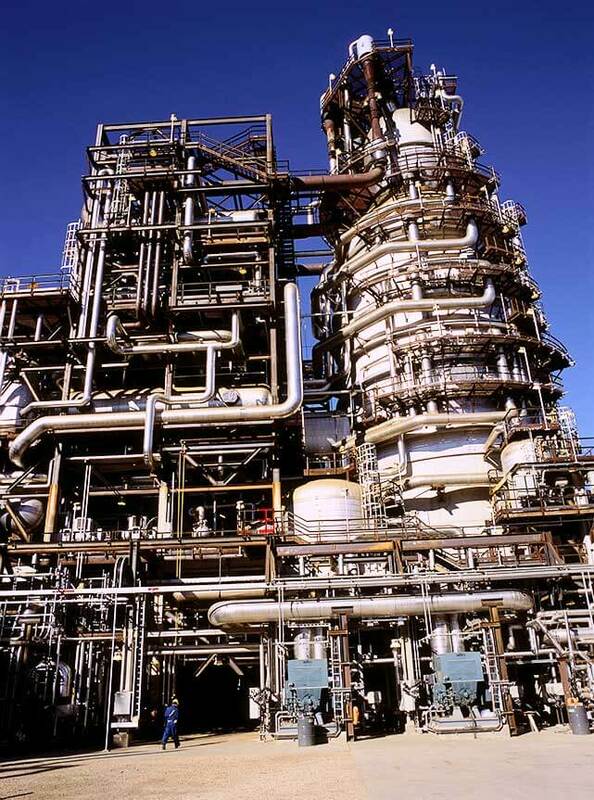 Shell’s Quest carbon capture and storage project at the Scotford refinery near Fort Saskatchewan, Alberta. Human civilization developed over a period of 10,000 years during which global average surface temperatures remained remarkably stable, hovering within one degree Celsius of where they are today. If we are to keep future temperatures from getting far outside that range, humanity will be forced to reduce fossil fuel emissions to zero by 2050. Halving our emissions is not good enough: we need to get down to zero to stay under the 2 C target that scientists and policy makers have identified as the limit beyond which global warming becomes dangerous. Many scenarios have been proposed to get us there. Some of these involve rapid deployment of solar and wind power in conjunction with significant reductions in the amount of energy we consume. However, many of the economists and experts who have developed scenarios for the Intergovernmental Panel on Climate Change (IPCC) believe that the only way to achieve the two-degree goal in a growing world economy is to invest in large-scale carbon capture and storage (CCS) projects. These technologies capture carbon dioxide from the exhausts of power stations and industrial plants and then permanently store it, usually by injecting it into underground rock layers. Even with massive deployment of CCS over coming decades, most scenarios modelled by the IPCC overshoot the carbon budget and require that in the latter part of the century, we actually take more carbon out of the atmosphere than we put into it. Climate expert Kevin Anderson of the Tyndall Centre for Climate Change Research at the University of Manchester recently reported in Nature Geoscience that, of the 400 IPCC emissions scenarios used in the 2014 Working Group report to keep warming below two degrees, some 344 require the deployment of negative emissions technologies after 2050. The other 56 models assumed that we would start rapidly reducing emissions in 2010 (which, of course, did not happen). In other words, negative emissions are required in all of the IPCC scenarios that are still current. One favoured negative emissions technology is bioenergy with carbon capture and storage (BECCS). This involves burning biomass – such as wood pellets – in power stations, then capturing the carbon dioxide and burying it deep in the earth. The technology has not yet been demonstrated at an industrial scale. Using the large amounts of bioenergy envisioned in such scenarios will place huge demands on land use and will conflict with agriculture and biodiversity needs. Even the relatively small use of biofuels in Europe that relies on North American wood pellets is already causing land-use impacts in the southeastern United States (John Upton of Climate Central has recently published an excellent report on this titled Pulp Fiction). The European demand for wood pellets is driven by an EU policy that deems biomass use to be carbon-neutral. However, evidence is mounting that this is not the case. It takes energy to collect, process and transport the pellets. It also matters whether the wood used is waste that would otherwise be left to rot or burn, or whether it is taken from mature trees. And, of course, it can take many decades for a forest to regrow to its previous size. The scale required of CCS and BECCS in most two-degree emissions scenarios is staggering. Humans consume vast amounts of fossil fuels at present, and the basic chemistry of combustion, which takes up oxygen, means that the mass of carbon dioxide produced is 2.8-3.7 times the mass of the fossil fuel itself. To get to zero emissions using CCS requires that three times or more matter be put back into the ground than was originally taken out. 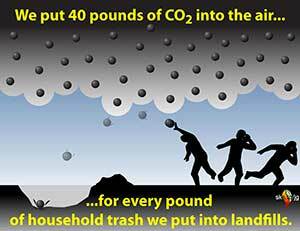 At present, North Americans produce about 40 times the mass of carbon dioxide than we do of household garbage. Already, many cities and towns struggle to find sufficient landfill sites for their trash. Relying on CCS and BECCS for mitigation will create a much bigger need to find room in safe storage sites underground. Carbon dioxide is stored as a supercritical fluid at the temperatures and pressures of the geological disposal layers, typically at a depth of 1,000 to 3,000 metres. This fluid has about half the density of water, but has some physical properties closer to those of a gas, allowing it to be injected into rocks with small pore spaces. Even though the volume of the compressed carbon dioxide fluid is much less than the volume it takes up as a gas at the surface, the quantities are still colossal. Calculations based on the most detailed published two-degree mitigation scenario by Detlef van Vuuren and others at Utrecht University in 2011 estimate that the volume of carbon dioxide in need of disposal by the end of the century is more than 60 billion cubic metres per year. That is equivalent to disposing of the volume of the water in Lake Erie every eight years. Injecting such a high volume of fluid into the ground is not without consequences. Existing subsurface fluids, mostly brines, will be displaced and there may be effects such as increased chances of earthquakes at some sites where there are faults nearby. The injected carbon dioxide must not be allowed to leak, not only because even slow leakage defeats the object of storage, but also because a rapid leak could pose a health hazard. The majority of the best storage sites are in sedimentary basins perforated by many tens of thousands of old oil and gas wells. Many of these wells have not been abandoned properly and could provide conduits for carbon dioxide to migrate to shallow aquifers or to the surface. If CCS is proposed in populated areas, one can expect there to be widespread public resistance to CCS projects in the same way that there are objections today to fracking and nuclear waste disposal. Widespread implementation will not simply be a matter of technology and economics. There are currently 14 CCS plants in operation around the world. All but three of these are associated with enhanced oil recovery (EOR) projects, in which the carbon dioxide is injected to force more oil out of an oil field. This brings up more carbon to the surface to be burned, making it disingenuous to regard such projects as mitigation solutions. In the absence of a carbon price or a government grant or mandate, there is currently no commercial case for CCS apart from EOR. The average capacity of the current 14 projects is about two million tonnes of carbon dioxide per year. According to some IPCC scenarios, we will need to dispose of 40 billion tonnes of carbon dioxide per year by 2090. That means that if we started in 2020 we would have to build 250 such plants every year, about one every working day for 70 years. University of Manitoba energy historian Vaclav Smil has argued convincingly that it is impossible to imagine that such a rapid transformation of the global energy system could take place. Canada currently has two major CCS projects underway. The Boundary Dam in Saskatchewan captures carbon dioxide from a coal power station and sells the gas to Canadian oil company Cenovus, which uses it for an EOR project. However, there are reports that there are serious technical problems with the project and it has so far only been able to capture a fraction of its one million tonnes per year capacity. Secondly, Shell has just started the Quest project in Alberta. This project is designed to capture one million tonnes of carbon dioxide per year from a heavy-oil upgrader and inject it into a deep, Cambrian-age sandstone layer. According to Shell, the estimated cost of this project works out to $72 per captured and stored tonne of carbon dioxide. The project has received $860 million in government support. The emissions of greenhouse gases emitted in Alberta’s upstream sector (the emissions involved in producing, but not consuming, Alberta’s oil and gas) amount to 73 million tonnes of carbon dioxide equivalent per year. So, roughly speaking, 70 Quest-sized projects would be required to make the Alberta upstream industry carbon neutral, assuming no future growth. In contrast, the recent report from Alberta’s Climate Leadership Panel on emissions mitigation mentions CCS just three times. The provincial plan unveiled by the province in November was similarly scarce on any mentions of CCS. There does not appear to be the political appetite within Alberta to launch such an ambitious adoption of CCS, even with the government’s embrace of a $30 per tonne carbon tax by 2017. Even if it were possible to get to 2100 with a mix of CCS and BECCS, it would not constitute a sustainable solution. Humanity would find itself stuck on a treadmill of increasing fossil and biofuel use with a growing need to sequester carbon dioxide. Sooner or later, either fuel resources or the resources of disposal sites would be exhausted. At best, CCS and BECCS would be able to provide a stopgap to a more sustainable future.